Feel Bach! flower remedies blog: Why is everyone Irish on St. Patrick's Day? Why is everyone Irish on St. Patrick's Day? We think... because it's fun. We all like to have a break in routines and an excuse to be just a bit silly. 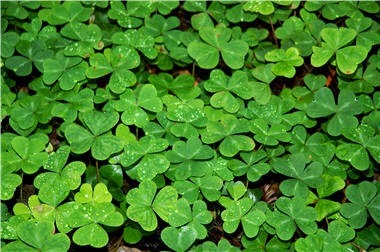 Maybe we secretly hope to find a 4-leaf clover among the shamrocks and bring ultimate good luck into our lives. Most of us know someone who will give us a pinch if we're not wearing green on March 17 - but how did that get started? There's an old story that says Leprechauns like to pinch (bratty school kids!) but if you're wearing green, they can't see you - so won't pinch you. Whatever the reason - if there's a parade in your city, go and enjoy it. And if you like beer - stop in a pub and have a glass of green beer.